Military Email Messages often need to be transferred over constrained networks such as HF radio, Satellite and other non-standard channels. The M-Switch Constrained Network Server and Gateway products have been designed to provide the core messaging infrastructure for these environments. Multicast and Point to Point operation. EMCON (Emission Control) – Radio Silence. Operation over Satcom and other IP Networks. Optimization for HF Radio and other slow radio links using STANAG 5066. STANAG 4406 (Military Formal Messaging). Control based on six level military message priority. M-Switch Constrained Network Server. Usually deployed on a mobile unit (such as an aircraft or naval vessel), the Constrained Network Server supports local users and is used for communication with other Constrained Network Servers and/or the Constrained Network Gateway. M-Switch Constrained Network Gateway. Used to exchange messages between systems running on high quality links and those running over constrained networks. 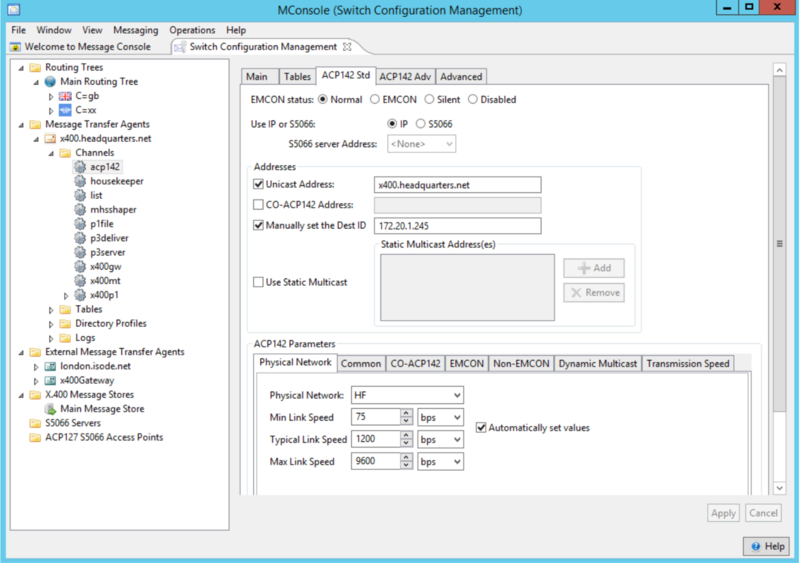 The M-Switch Constrained Network Gateway does not support any local clients, except those necessary for configuration and administration purposes. A key feature of M-Switch for Constrained Networks is the ability to support and map between multiple protocols using a channel architecture, with different channels for different protocols. Multiple networks can be configured and a channel associated with each network, messages can then be routed between the various networks. Where a destination can be reached over multiple networks, route weighting can be used to select the preferred route taking into account factors such as message size and priority in the choice. ACP 142 supports messaging over both IP and STANAG 5066. Whilst IP is suitable for most SatCom networks, Isode strongly recommends running ACP 142 over STANAG 5066 for HF networks and provides its own STANAG 5066 Server, Icon 5066, for this purpose. As can be seen from the diagram above, Isode's approach to constrained bandwidth networks is to use server/server communication over the constrained links, rather than client/server. This means that a server will always be used, even to support a single user. The advantage of this approach is that the client (and user) is isolated from performance problems of the underlying network, and that slow network performance does not slow down the user interface. This approach also means that special low-bandwidth clients are not needed; any standard familiar client can be used. A consequence of this is that Isode's optimized messaging protocols in M-Switch, and other messaging server products (in particular M-Box and M-Store), will always communicate through M-Switch and so do not need optimized protocol support. The central protocol to Isode's constrained communication solution is ACP 142, sometimes known as 'P_Mul'. ACP 142 provides reliable multicast, which is an essential base service. ACP 142 is implemented as a channel in M-Switch products. M-Switch products use channels for each of the various protocols that it supports. The ACP 142 channel runs as a server, to process incoming requests. M-Switch provides extended EMCON extensions to support broadcast only networks (e.g. NATO BRASS (Broadcast as Ship to Shore)) and extended outages. The two mode model of ACP 142 EMCON is extended to four modes, and the option is added to treat a message as delivered after a configurable number of transmissions. Two network mappings are provided for ACP 142 protocols. The first is to use IP, which is widely supported and ideal for some underlying networks and in particular for Satcom. ACP 142 uses UDP to map onto IP, and CO ACP 142 uses TCP. ACP 142 utilizes IP multicast addressing. The second mapping is to use the STANAG 5066 protocol. The ACP 142 channel accesses a STANAG 5066 server using the STANAG 5066 SIS (Subnet Interface Service) protocol. Isode's own STANAG 5066 Server, Icon 5066, is a modem-independent STANAG 5066 server, enabling applications to work efficiently over HF Modems/Radios and allowing multiple applications to work simultaneously. STANAG 4406 specifies military formal messaging, is based on the X.400 messaging protocols and is a capability of M-Switch X.400. STANAG 4406 Annex E defines support over constrained networks using ACP 142, giving simple protocol mapping and extensible compression mechanism. Default compression uses ZLIB, which in turn uses DEFLATE. Isode provides SMTP messaging on constrained networks by use of the same ACP 142 infrastructure used by STANAG 4406 following RFC 8494 MULE (Multicast Email). . This provides an integrated solution for support of Internet Messaging. Military messaging over SMTP is supported using RFC 6477 and related extensions as outlined in the product page for M-Switch STMP. M-Switch supports the ACP127 family of military messaging protocols (see M-Switch ACP127 for more details). These can be operated over HF Radio using STANAG 5066 and also operating directly over HF modems. This is often used for Naval communication and in particular for BRASS (Broadcast and Ship to Shore) and BRE1TA (BRASS Enhancement 1 Technical Architecture) deployments. Isode recommends ACP 142 use for constrained bandwidth messaging over STANAG 5066 in preference to CFTP (also known as BFEM or "Battle Force EMail"). CFTP support is provided within the M-Switch Constrained Network products for those customers unable to implement ACP 142. More on CFTP and other constrained bandwidth protocols can be found in the whitepaper [Messaging Protocols for HF Radio]. Configuration of the ACP 142 channel, monitoring and use of constrained network protocols is done within MConsole, which monitors the M-Switch queues, giving additional information on ACP 142 traffic, including partially received and transmitted messages. MConsole provides a “Message Transfer View” that is optimized for ACP 142 operation. It shows inbound and outbound ACP 142 messages, with progress bars for messages in transit, and estimated times for message and full queue delivery. Operators have control to delete queued messages, which may be desirable when queues build up. In addition to the Open Standards supported by M-Switch X.400 and M-Switch SMTP, M-Switch for Constrained Networks conforms to the following Open Standards.